When the theme Rhythm came up, my initially thoughts were of a repeated pattern with some dissonance. I really wanted to make an abstract piece this time. But on Christmas eve I was standing outside looking at one of the guys of our island playing the steelpan and all of a sudden it hit me that living in the colorful Caribbean and being surrounded by music and rhythm I had to use this as my subject. 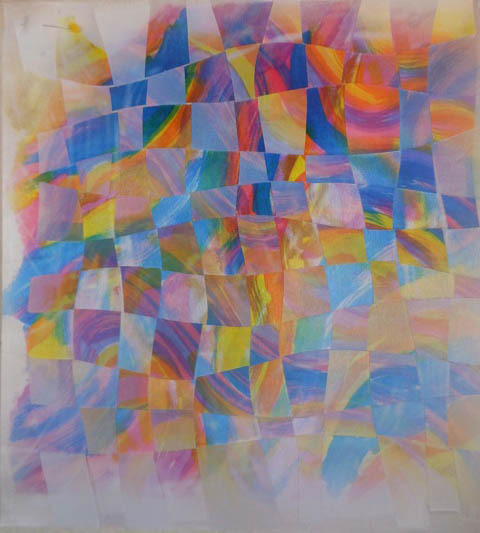 So I started by painting with transfer paint two different Rhythm patterns on paper. I ironed the designs on two panels of white synthetic satin and on the background with “misty fuse”. In the first panel I cut some curvy lines and the second panel I cut up in curvy strips and plaited them into the first panel, like we did in Kindergarten. Next step was drawing the steelpan player. I found some pictures on the internet and changed the design in Photoshop Elements, cut up the pattern in different pieces and appliquéd them on a piece of white cotton. The cut out figure is then fused onto the background, covered with dark blue tulle and stitched on with invisible thread using zig zag stitch. I did some thread painting on the steelpan and hair. 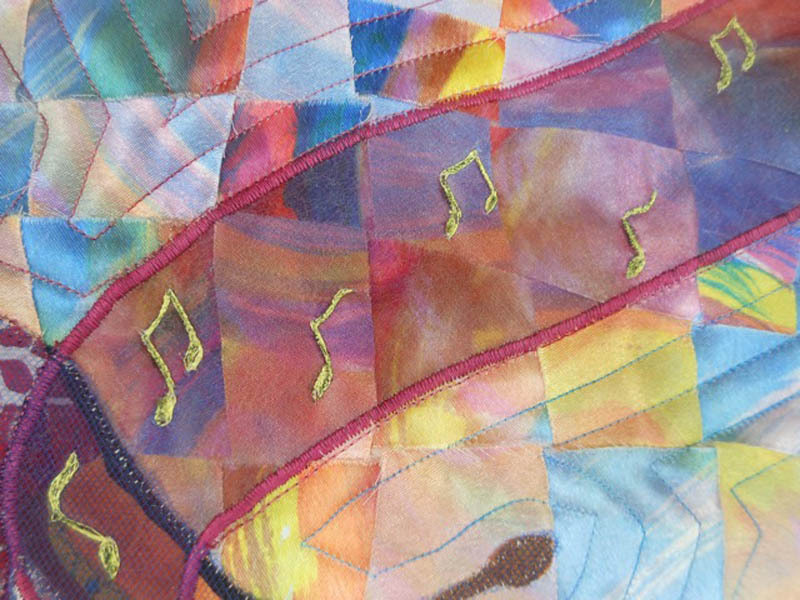 The music “streams” are fused as well and finished with a cordon stitch. 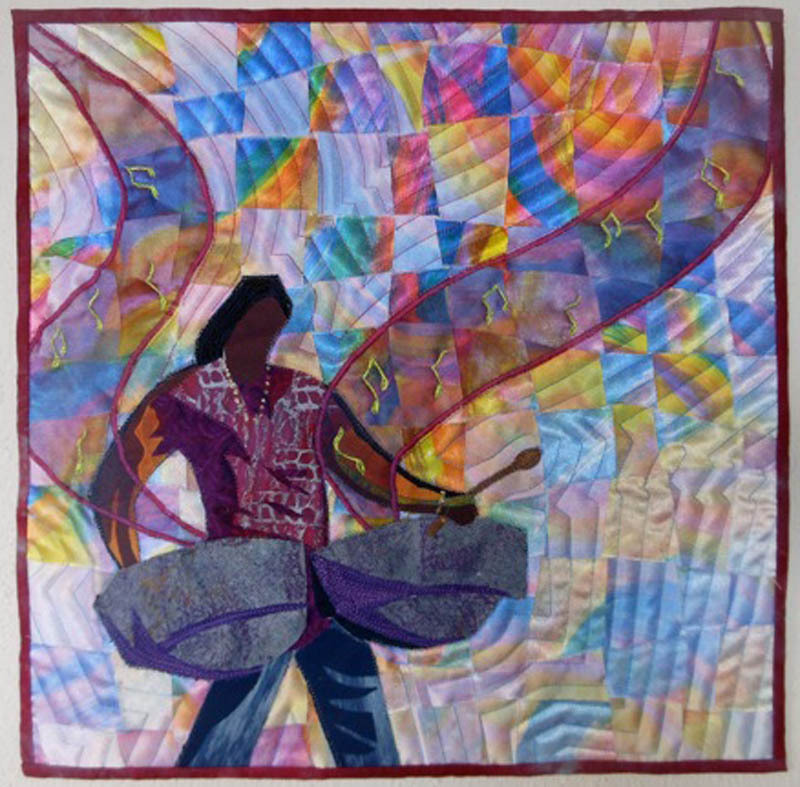 The music notes are free motion quilted and the quilting lines on the bottom in blue and the top in pink are echoing the musician to enhance the rhythm idea. Finishing touch: a necklace and bracelet in 3D gold paint. I love it Els, will you bring it for Beaujolais ? Hi Chantal, Yes I was planning to take it with me. Hope you bring all yours as well. Els this is lovely. The colours are fabulous. Great idea. Els, I can hear the music, and I love the background it was a great success. Fabulous. Els, I really like the juxtaposition of the swirling ‘ribbons of music’ against the curvy piecing of the background. The warm colours cheer me in the midst of this very long winter!